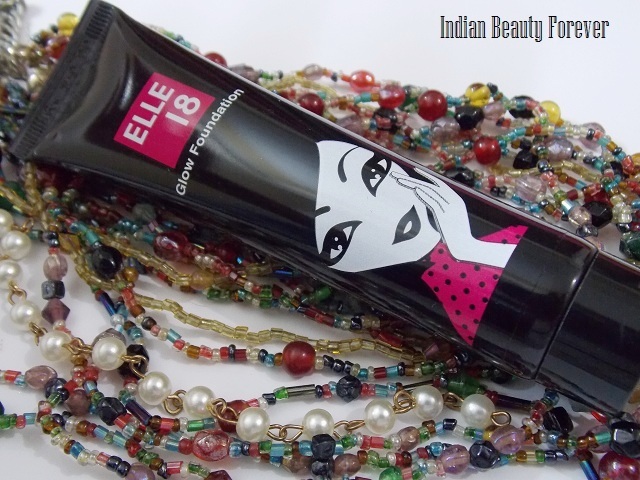 In this post I will be reviewing the last Elle 18 product out of my vanity and that is Elle 18 Glow foundation. These glow foundations are available in 4 shades. It’s really hard to tell which one is the lightest I think pearl is the lightest then Marble, coral and shell is not the darkest but has visible yellow tones to it. It comes in a black tube with Elle 18’ trademark logo and picture on it. It looks cute and easy to carry. 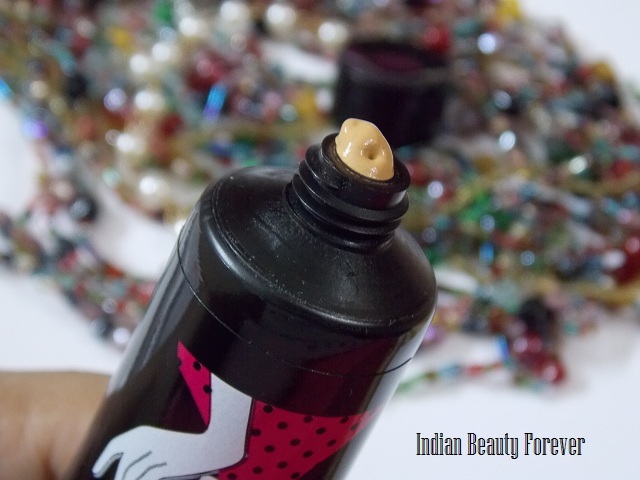 Shell is a color that has a lot of yellowness to it due to which this can suit Indian skin tones very well and this shade shell only can cater to majority of our complexions, if not all like very fair or too dusky. 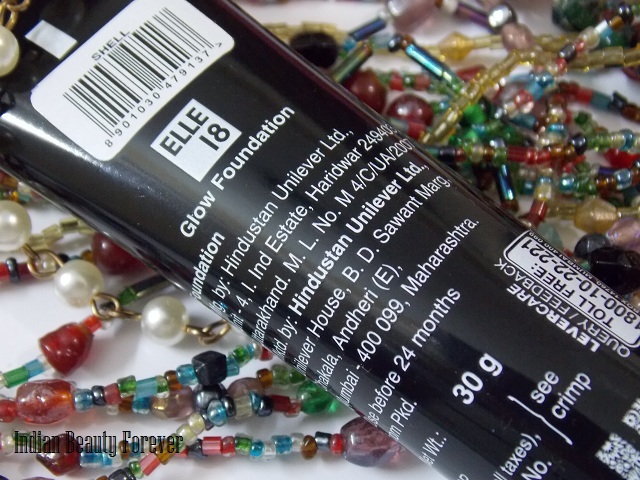 This Glow Foundation has a medium consistency which reminds me of Lakme’s Radiance foundation. Once blended it gives a sheer coverage as the foundation during blending kind of get thin. It makes your skin even toned and better than before though it won’t be able to cover up your spots, blemishes etc but can make your skin look a bit better than not using anything. I take a pea sized amount for my entire face and dot it all over the face, as it has a medium consistency it gets blended easily. There are no streaks or patches and can be applied with your fingers. Once blended it gives a glowy finish which I will say is intermediate between dewy and matte. As I said it gives sheer coverage and feels light on the face, it will be suitable for girls looking for affordable sheer coverage foundations or who do not need much concealing. 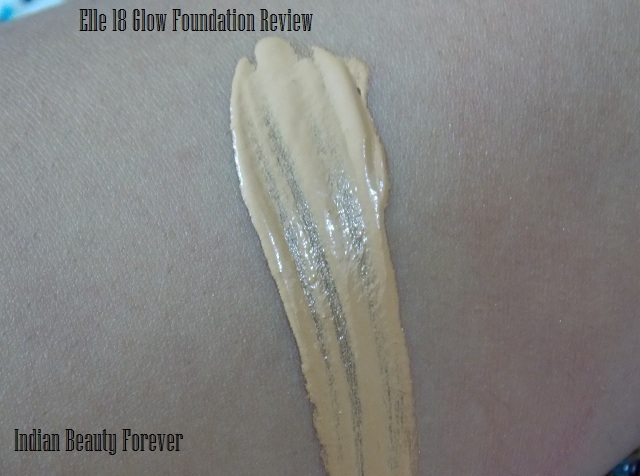 I will not recommend it to someone who need to cover up more or need heavy to medium coverage as this Elle 18 Glow Foundation, cannot deliver that. It stays on much longer till the time you do not sweat for go out in the sun where it is more likely to melt away as it is not waterproof or sweat proof. It is water based so, can be used by even oily skin types. I have used this foundation a couple of times and it has not break me out yet but still there is no Ingredients list mentioned. It doesn’t have SPF so, you need to apply that beforehand and it doesn’t give whitecast in photos. 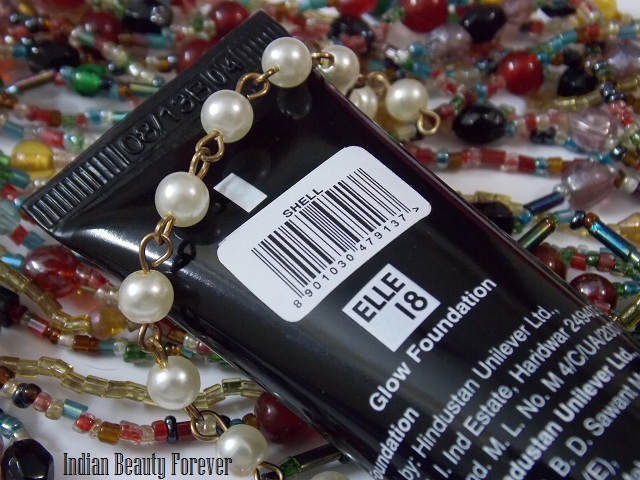 Take- Elle 18 Glow foundation is an affordable, sheer coverage foundation that is suitable for all skin types and suitable for those who need less coverage but just something to make their skin a bit better than before. It blends easily and stays till the time you do not sweat. Sounds great n really affordable too! 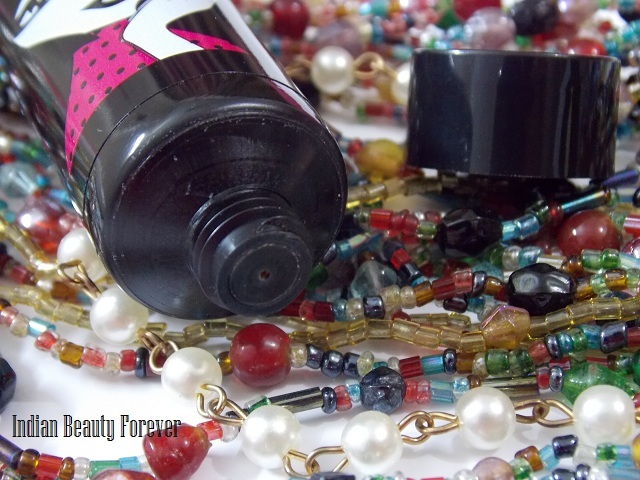 Lovely pics n review hon! Thank you Rajani! Do try it if you need sheer coverage. i am confused which shade i shud go for.. pearl or marble.. nicely reviewed Niesha.. yeah good fr everyday!! I think you should go for marble. very affordable and sounds decent product! It is decent at the price. I so agree Heena. BB's are better these days at the price. wow, it sounds amazing for such an affordable price! Nice review!!! Sounds like a product for younger girls who don't need the coverage as much! I prefer medium to full coverage and then I just apply the layers I need! I won't ever go for light coverage unless its very longwearing! lovely.. Can we follow each other on g+ bloglovin and gfc? will visit you soon Sabina! Nice product for every day use! Great review Niesha! I sweat a lot think I should skip it as it wont stay longer. yes Subha, it's not for you then!